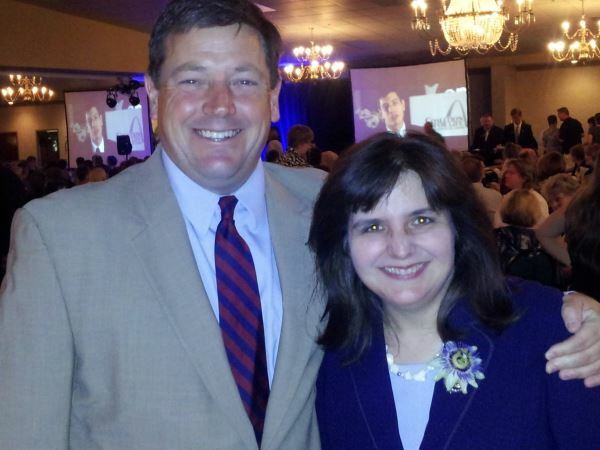 I first met Ed Martin years ago when he was the Chief of Staff for Governor Matt Blunt. Since then, we seem to have followed each other around the state involving ourselves in many common causes with a similar grassroots base of supporters. When is enough enough? It’s wearisome to constantly get e-mail messages informing us of the travesty being perpetrated on us by our government. We’re asked, even begged to take action by calling, writing and signing petition after petition. We know the man in the White House is a disappointment, but we expect more from our Republican dominated Congress. Before October of this year, we had a “Debt Ceiling” that required some restraint from both Parties. This year during the budget votes, our Congress got rid of it. Unfortunately, a lot of voters get squeamish at the thought of having to vote against the one who represents them. But we have to get past that. Change will never happen if we aren’t brave enough to apply negative consequences for bad behavior. The majority of the Congress members promoted themselves as being conservative during the campaign season, when they wanted our money and votes. We can only conclude they were either insincere or they gave up the fight. There is only one remedy for these situations—that is to replace them with people of integrity who will keep their promises to those they represent. The reason we are in this mess today is because the Congressional leadership let Obama know they were afraid to shut down the non-critical parts of government to get a good budget passed. This allowed Obama to do whatever he wanted. The taxpayers were raided, fiscal responsibility went out the window and the campaign promises on which most of them were elected became meaningless. We should expect the same on every other battle, i.e. guns, education, freedom of religion, welfare spending, freedom of speech, abortion, property rights and on and on. However, we have some answers. We don’t have to take this lying down. Let’s do something! 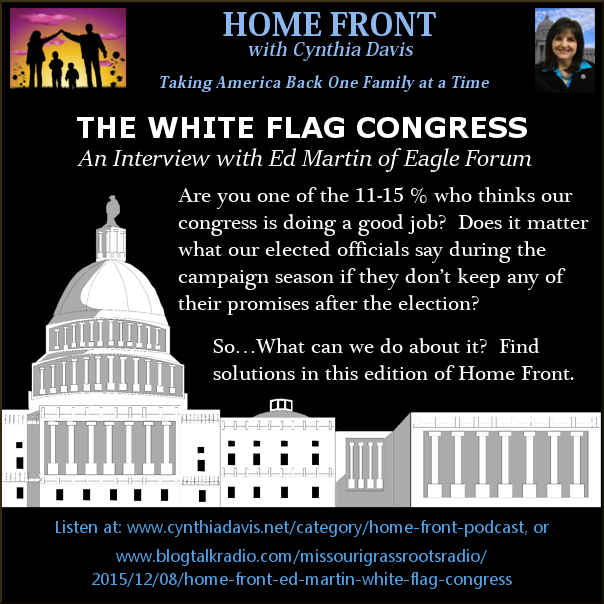 The White Flag Congress (whiteflagcongress.com) is a coalition of organizations committed to exposing the culture of surrender in Washington DC. It’s time to call out legislators by name when they capitulate and cave in to more government overreaching and overspending. We need a congress that will stand against oppression instead of making accommodations and then making more excuses to the taxpayers. Appeasing tyrants is not getting us where we need to go. 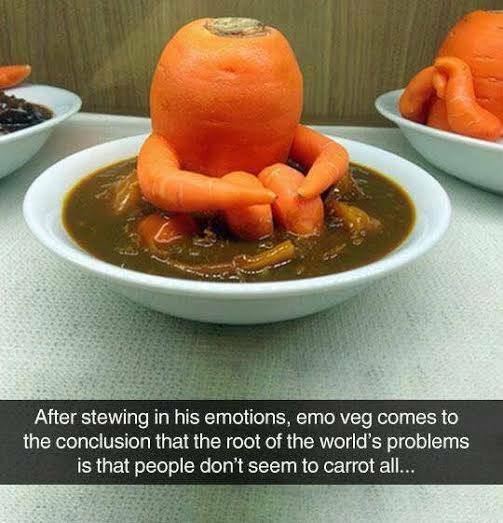 In fact, it’s only making things worse. If our leaders continue on this path of giving in all the time, our life, liberty, property and prosperity will be gone. True accountability only happens at the ballot box. 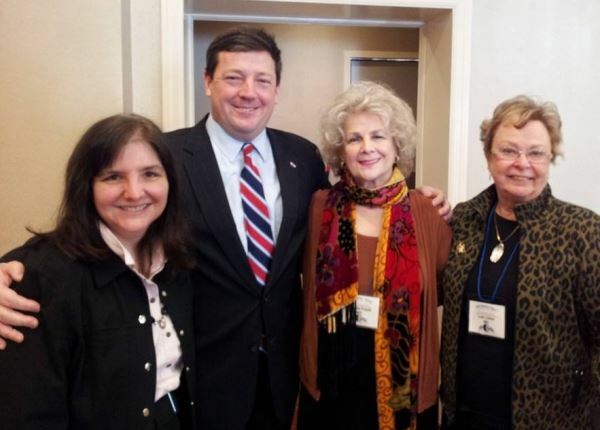 Here is a picture we snapped with me, Ed Martin and two other movers and shakers! Well written and encouraging to know that we CAN DO something to make a difference. Please keep us informed and educated in what we can do to preserve our freedoms. If you are serious about fixing Washington, go to http://www.conventionusa.org. Just electing new people won’t change anything as the Tea Party found out a couple of years ago. With all due respect, I believe that electing honest and courageous men of integrity who are committed to honoring God and upholding the Constitution as currently written, is America’s only hope. The blessings of liberty cannot flourish in a country governed by any other kind of men, no matter what the constitution of that land might be. The trouble with the Tea Party (and other populist uprisings) is that it was not accompanied by a change of heart in the people, but only a change of “some” office holders and not even a change of party. The Tea Party was co-opted back into the Republican Party fold and merely elected a different crop of people with an “R” after their name who quickly learned to toe the line of the same corrupt establishment leadership. America is in need of men of courage who love liberty more than life and are unwilling to compromise their principles for any cause. Without such leaders, no plan, device or constitutional amendment will save us. If we lack the courage and character to elect such men, then we will continue to reap the harvest that we deserve. Wish you’d have chosen a better name than “white flag Republicans.” That’s what I’ve been calling the RINOs, double dealers, and party hacks interested in selling out for their gain. When the calvary showed up to win the day, they weren’t waving the white flag of surrender. Agree with Judge Brennan: need a convention of states…and time would be NOW while Republicans control so many state legislatures! A pistol resting on top of a Bible would be an appropriate logo….. Sorry, but Ed is flat-out WRONG right out of the shoot – these Republicans are NOT “…men and women of good will…”. This is the problem; as long as people like Ed apologize for them by implication without calling it what it is they will continue to take advantage of people like Ed (and his organization). Let’s unapologetically start telling it like it is – our congress is full of masters of deceit, they are LIARS. This is the most sickening Congress in the history of the party. I think the party is in for a real drubbing in 2016 – with seats going to tea party candidates. Cruz will not make it opposing Trump’s ban on immigration to please Karl Rove. Jimmy Carter banned Iranians from entering the U.S during the Iran hostage crisis without resistance. Furthermore, in 1952 Congress enacted the Immigration and Nationality Act of 1952, which bars the entry of any alien belonging to an organization advocating the overthrow of the federal government by force, violence and other unconstitutional means. This Act should have been enforced by Obama.